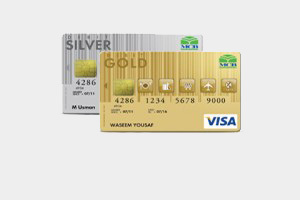 MCB now brings you Visa Debit card – Pakistan’s 1st chip based debit card. It allows the customers to enjoy unmatched convenience, enhanced security and round-the-clock accessibility to their funds. The MCB Visa Debit card offers innovative promotional schemes designed to reward our customers every time they use the card to pay for shopping, dining, fuel, travel etc. Features such as increased withdrawal limits, SMS alerts, door step delivery, instant Automated Teller Machine (ATM) PIN generation via call center, e-statements and variable spending limits add to the convenience it offers. To find out more, call our 24/7 Call Center 111-000-622 or simply visit your nearest MCB Branch. * Charges exclusive of FED & other taxes, if any. Call 111-000-622 from your registered mobile number.